Assured Automation offers a valuable new resource. 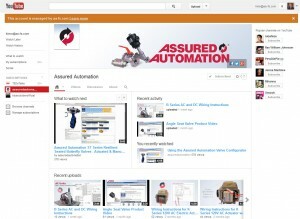 Our YouTube Channel highlights the features and benefits of our product offerings. Some of our videos includes in-depth information on PVC digital water meters, angle seat valves and the VA Series-Compact automated on-off control valve that has been tested to well over 1,000,000 cycles. The channel features our unique online Configurator video as well as an extensive selection of actuator wiring demonstrations. Videos are kept short and to the point and are interesting as well as informative. This entry was posted in Latest News and tagged Actuator Wiring Videos, Automated Valve Videos, Flow Meter Videos, Valve Videos. Bookmark the permalink.